Tymon Mellor: At the turn of the 19th century, railways and steam ships were changing the world and demanding new infrastructure to support them. 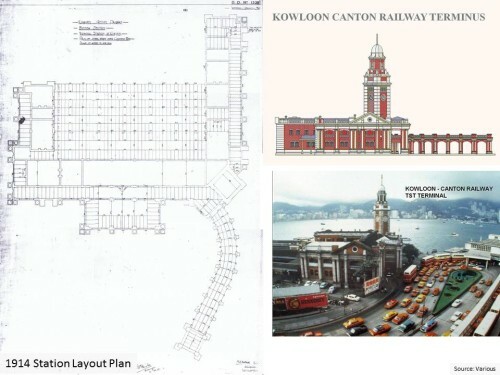 With the construction of the Kowloon-Canton Railway – British Section in full swing, attention turned to the location of the terminus station in Kowloon. There were many competing requirements for the location; resulting in the site only being fixed 18 months after the opening of the railway in 1910. Selection of the location for the terminal station was dependent on a number of criteria, and these included; the availability of suitable land, close proximity to marine facilities, convenience, and provision of sidings/buildings required for cargo handling. 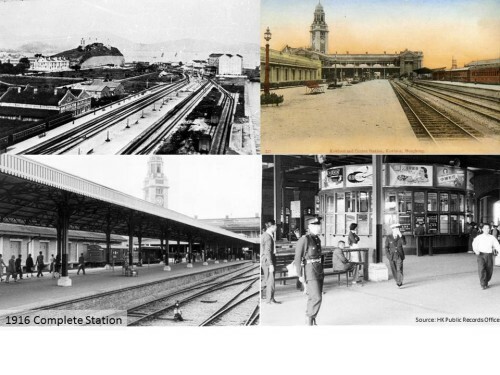 From the original location proposed in 1899, to the final location selected in 1912, six different sites were selected for the terminus station, each one being the preferred solution (at the time). Ironically, the selected location at the south tip of Kowloon, was abandoned in 1975 for the new station at Hung Hom, the original preferred location! In 1899, Mr P. T. Somerville Large working for the British Chinese Corporation, prepared the first alignment for the proposed Kowloon-Canton Railway. Details of the station were scant, other than it indicated a terminus on reclaimed land at Tsim Sha Tsui, at the southern tip of the Kowloon Peninsula. The site was generally accepted by the public, but as noted by the Governor, Sir Matthew Nathan in January 1906; “the reclaim land was private property which could only be resumed at enormous cost” and “the area available was too restricted for a satisfactory terminus, that it could not be extended without unduly encroaching on the fairway of the harbour”. Thus, an alternative location was pursued for the next six years. Sir Matthew Nathan had a keen interest in establishing a site for the Kowloon station, and one that would not interfere with the development of Kowloon. 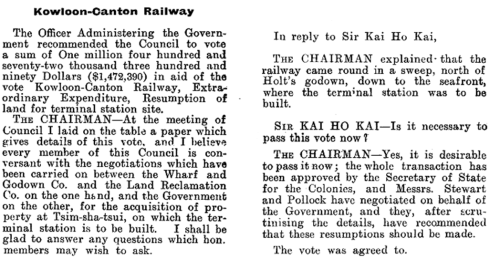 In January, 1906 he endorsed the proposal from the Director of Public Works, Mr Chatham, for a site in Hung Hom. The proposal was to reclaim a small area for the station and goods depot, with marine access to allow cargo to be transferred using lighters. As the business grew, a second reclamation would be undertaken, allowing the largest vessels of the time to unload directly onto the quay side. The cost of the initial reclamation was estimated at $585,000 for 22 hectares and the full development of 58 hectares at $9,576,000. There was great discussion on the appropriate ship size to accommodate, as for ships travelling to Europe, their size was constrained by the Suez Canal, but for the trans-Pacific routes, larger ships were being operated requiring a draft of 12.2m. Dredging would be required. 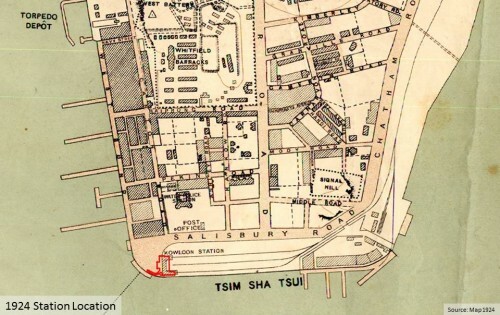 The station was to be located alongside Des Voeux Road (later renamed Chatham Road) to the southern end of the initial reclamation with the remaining area used for cargo handling. Workshops for the railway would be provided on new reclamation in Tak Kok Tsui bay, on the west side of Kowloon. By March 1907 it had become apparent that the 1906 scheme did not provide sufficient land to accommodate all the railway related requirements. 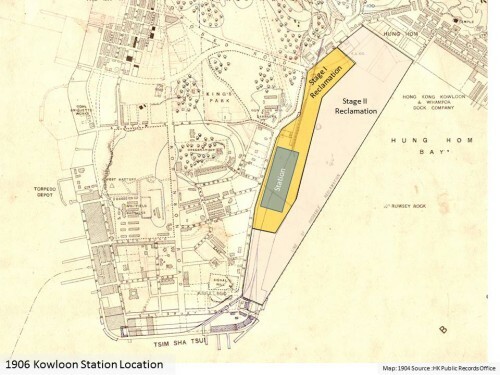 However, this could be addressed if the reclamation was extended a further 305m southwards, joining with the existing reclamation of Marine Lot 81, owned by Messrs Blackhead and Company (known as Blackhead’s Lot). 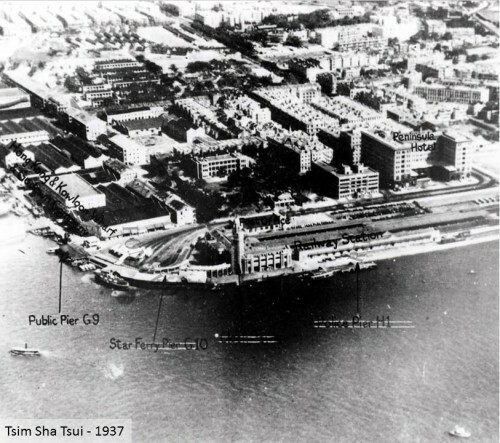 The Governor also recommended acquiring the Blackhead’s Lots (81 and 34) to allow the station to be constructed partially on rock rather than reclaim and provide space for a siding to be extended around Kowloon Point to connect to the warehouses belonging to Hong Kong Wharf and Godown Company and Butterfield and Swire. An alignment was also developed to connect to the Kowloon Docks. With the addition of suitable piers, the site would also allow ocean steamers to moor alongside and the Star Ferry could be relocated to new piers and provide a dedicated railway station service from Hong Kong Island. The cost of the Blackhead’s Lots and associated buildings was estimated at $612,000, and along with required modifications to roads, the cost of the scheme had risen to $1,915,000 from the original $585,000. 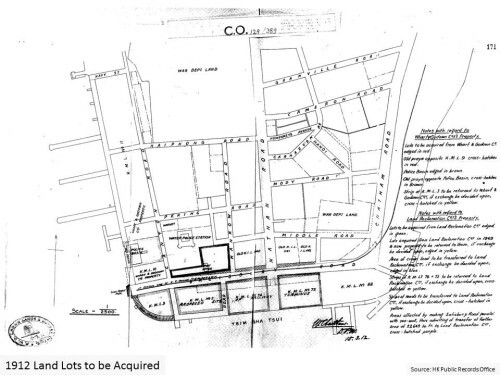 With endorsement from EXCO, this was the scheme to be developed and it even made it onto the map of 1910. By March, 1908 Governor Sir Frederick Lugard was now in charge and had decided to review the Blackhead proposal (Scheme 1) along with two proposed new sites, Scheme 2 and Scheme 3, located either side of Nathan Road. the need to birth more than one ferry-steamer to accommodate the anticipated passenger demand. The Governor considered the station arrangement, with a north-south platform with single access from the south was not satisfactory. Given this was to be the terminus of the “line from Peking to Canton and Hongkong, and indeed from Europe via Siberia to South China”, he wanted something more convenient. 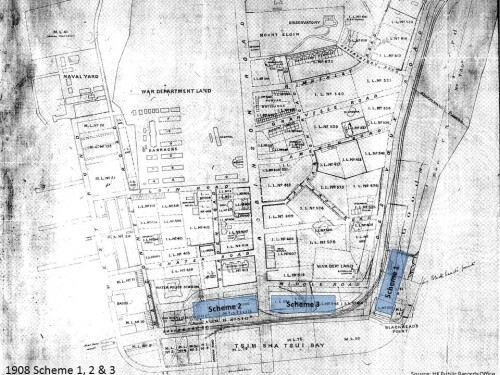 The Director of Public Works had suggested swinging the railway alignment westwards to follow Salisbury Road and located the station in the land to the north, Lot 1140, located between Canton Road and Nathan Road (Scheme 2). This would also require the acquisition of Lots 1141, 443, 442 and 618 and major changes to the local road network. However, this arrangement had the advantage of maintaining the deep sea wharf, while locating the passengers closer to the Star Ferry. After further consideration, a third solution was developed, locating the station to the east of Nathan Road and which avoided the need to acquire Lot 1140 (Scheme 3). Thus three schemes were developed and the Government’s consultant, Sir John Wolfe Barry & Partners, was asked to review them. In August, 1908 Sir John Wolfe Barry responded, agreeing that Scheme 2 and 3 were superior to Scheme 1. 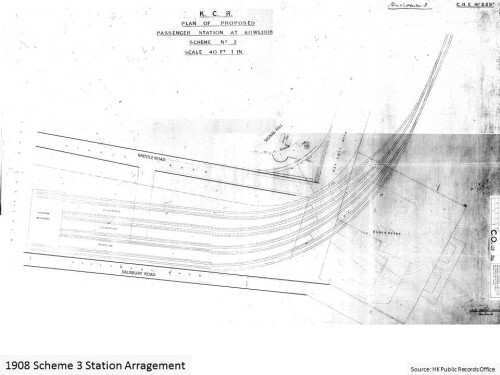 Taking into account the land constraints, including the necessary cutting back of Signal Hill, they concluded that Scheme 3 “is the most advantageous for the Terminal Station of so important a Railway”. However, noting that the alignment may dictate the need for additional space, they recommended, acquiring the land for both Schemes 2 and 3 and that if the budget was limited, to build a temporary station at the site of Scheme 2. By the spring of 1909, money was in short supply, “the present condition of the Finances of the Colony, the ordinary Revenue of the Colony is entirely unable to bear the cost of these resumptions” and the Government was looking at ways to minimise cost. The idea of a temporary station arrangement was considered, but this would be located to the east of Nathan Road, in the Scheme 3 site. The Governor was looking for a loan or would have to dip into the reserves. It was not helped by the cost of the railway construction increasing by $1.5million during the year. The cost of the land for Scheme 2 and 3 was estimated at $737,167 of which the railway use represented $331,000, with the remaining available for short leases. train movements, particularly for taking on water, had not been considered. Lindsey’s solution was to locate the station on the new Hung Hom reclamation between Cameron Road and Gascoigne Road, and to use the new tram system to support the station. A siding would be aligned down Salisbury Road to support the freight traffic to the wharfs and provide a “flag stop” for passengers, with the cost of this being paid for by the godown companies. By the summer of 1910, all the land for Scheme 2 and 3 had been acquired at a cost of $747,285. However, discussion between the different stakeholders continued without agreement on a clear solution. Towards the end of 1911, it became clear that none of the solutions developed were ideal and yet the Government had now acquired large areas of land for an undesirable solution. 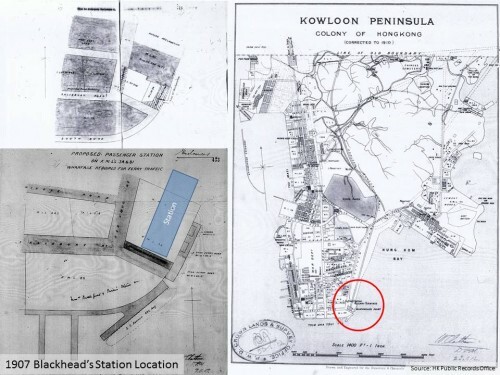 It had always been recognised that the ideal place for the station was at Kowloon Point in Marine Lots 9, 3, 74 and 75. However, the cost of acquiring them was considered prohibitive. After further discussion, it was realised that a land swap deal could be arranged with the land to the north of Salisbury Road and the addition of other near-by Government Land, notably the marine basin for the Police. 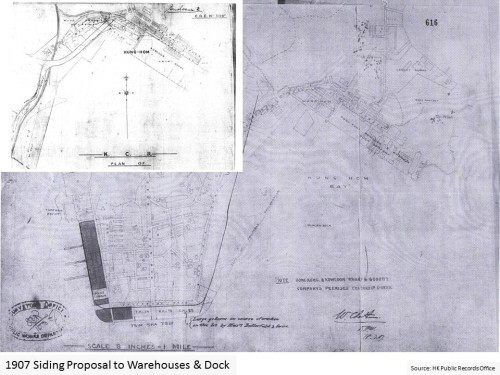 By the end of the first quarter of 1912, negotiations with Wharf Company (Lots 3 and 9) and Land Reclamation Company (Lots 74 and 75) were complete and a deal was in place. The remaining sea front Lot ML88, was owned by Messrs Holt and Company, and the station approach tracks passed through their land. A deal was done to exchange land to east towards the Blackshead pier. On the penultimate day of his duty, Governor Sir Frederick Lugard wrote on the 15th March, 1912 to the Colonial Office confirming the arrangement to swap land worth $1,039,771 along with $432,618 of cash. On the 6th June, 1912 LEGCO was asked to approve the sum of $1,472,390 for land resumption for the site. The motion was passed. A station design had been developed as a generic solution and this was given to Mr. A. B. Hubback, a Government Architect for the Federated Malay States, the appointed architect for the building. The general arrangement of the station was completed by the end of 1912 allowing works to commence on the sea walls and site formation, following the demolition of the warehouses and other buildings. Temporary buildings were erected for the railway office along with the laying of temporary sidings. Construction of the foundations commenced in May, 1913 and completed in February, 1914. The works was managed directly by the Government on piecework rates for a total sum of $34,651. With the completion of the station plans, the contract for the superstructure was awarded for a value of $173,847 on the 26th February, 1914 to Kan On. 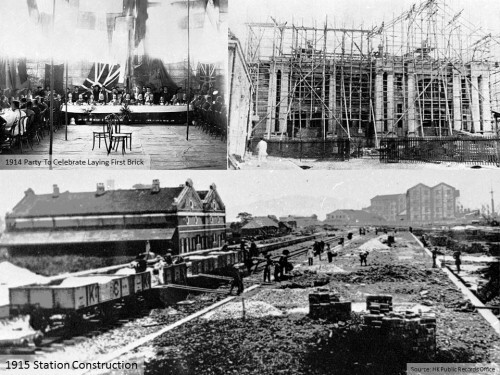 The works were to commence on the 1st March, 1914 with a completion date of 1st March, 1916. The building was designed as an elegant two-storey structure utilising a steel frame, clad with red brickwork, white granite columns, architraves and pediments. In front of the building was a large open area for rickshaws and carriages serving both the railway and the adjacent Star Ferry. An elegant colonnade linked the station to the Star Ferry, providing shelter from the elements. The ground floor of the station provided public facilities including the booking office, refreshment rooms, waiting rooms, and the Customs offices where passengers travelling to China could have their luggage inspected to avoid delays at the border. The first floor was given over to railway offices. The steelwork for the station was procured from the UK and despite the impending war in Europe, it arrived on time. The steelwork for the platform canopies was late arriving, exposing passengers to the elements until it could be installed. Construction of the two platforms of 600ft (183m) and 700ft (213m) was managed by the Government on piecework rates for an estimated cost of $30,058 and a final cost of HK$53,681. Good progress was made during construction, although there was concern about the clock tower, as there had been a delay in arranging the delivery of the clock. In the end, the major problem was with the delay in sanitary fixings. The European supply was late due to “their works have been unfortunate in the manufacture of the pottery part and they had to remake”. The building was open to the public on the 28th March, 1916, 27 days late due to delays with the delivery of sanitary fittings as a result of supplier problems! With the inclusion of fixtures and fittings, the total cost of the station was HK$302,823. The station was operated until 1974, when, due to limited space, it was relocated to Hung Hom and the structure was demolished in February, 1978 leaving only the Clock Tower. This article was first posted on 16th December 2015. KCR – Tai Po Kau station – dramatic film!